The Swedish-American company Plantagon was awarded the 2012 SACC New York-Deloitte Green Award for their breakthrough green innovation within the food chain, the Plantagon Vertical Greenhouse. 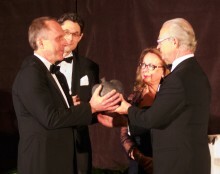 The award was presented by H.M. King Carl XVI Gustaf of Sweden at a Royal Gala Award Dinner on October 3 in New York. Representing Plantagon were CEO Hans Hassle and Chairman Professor Oren R. Lyons. Press invitation. Welcome to The Urban Agriculture Summit 2011 to discuss "How do we feed people in the urban era?" at House of Sweden, Washington D.C. on November 16. Join Swedish clean-tech and American know-how in a half-day seminar on how to use urban agriculture technologies to create a more sustainable city of tomorrow. Maximum Profit - no longer a reason for a company to exist! Unexpected meeting between Indian Chiefs and the US ambassador on Swedish soil - and an innovation that ends up in Shanghai. Plantagon is named as one of three finalists by Swedish-American Chamber of Commerce in New York for its 2011 Green Award, to be presented to the winner by HRH Princess Madeleine of Sweden at the Royal Gala Dinner on November 1. Future Cities - Creating Tomorrow's World - is a major international conference exploring innovative new approaches to designing, managing and financing sustainable living environments. The conference held in Stockholm, October 18-19, featured leading authorities in urban planning, energy, architecture, etc. Hans Hassle, CEO of Plantagon, talked on "Beyond Tomorrow: Future feeding".